Colchester moved above Swindon into fifth in League Two thanks to an enthralling win at the County Ground. Kaiyne Woolery pounced on a loose ball in the box to put the Robins ahead but Frankie Kent lashed home a corner to level with the last kick of the half. The U's then led when Mikael Mandron headed in Kyel Reid's free-kick. 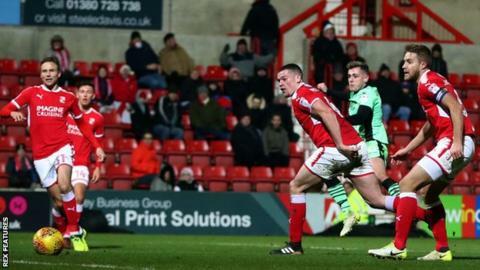 Kellan Gordon made it 2-2 when a corner was not cleared, but Sammie Szmodics beat a man to drill in his 10th goal of the season for Colchester to triumph. David Flitcroft's Swindon have now lost five games in a row in all competitions and could fall to 11th after Saturday's fixtures. Match ends, Swindon Town 2, Colchester United 3. Second Half ends, Swindon Town 2, Colchester United 3. Attempt missed. Sanmi Odelusi (Colchester United) right footed shot from the centre of the box misses to the left. Corner, Colchester United. Conceded by Ellis Iandolo. Foul by Oliver Lancashire (Swindon Town). Foul by Sean Murray (Colchester United). Foul by Matt Preston (Swindon Town). Sean Murray (Colchester United) wins a free kick in the attacking half. Corner, Swindon Town. Conceded by Kane Vincent-Young. Substitution, Colchester United. Sean Murray replaces Kyel Reid. Attempt missed. Matthew Taylor (Swindon Town) left footed shot from outside the box is high and wide to the left from a direct free kick. Kyel Reid (Colchester United) wins a free kick in the attacking half. Goal! Swindon Town 2, Colchester United 3. Sammie Szmodics (Colchester United) left footed shot from the centre of the box to the bottom left corner. Assisted by Drey Wright. Goal! Swindon Town 2, Colchester United 2. Kellan Gordon (Swindon Town) left footed shot from the centre of the box to the centre of the goal following a corner. Corner, Swindon Town. Conceded by Tom Lapslie. Attempt missed. John Goddard (Swindon Town) left footed shot from outside the box is high and wide to the left. Substitution, Swindon Town. Kellan Gordon replaces Donal McDermott. Attempt missed. Kane Vincent-Young (Colchester United) left footed shot from outside the box is too high. Attempt blocked. Kane Vincent-Young (Colchester United) left footed shot from outside the box is blocked. Mikael Mandron (Colchester United) wins a free kick in the attacking half. Goal! Swindon Town 1, Colchester United 2. Mikael Mandron (Colchester United) header from the centre of the box to the bottom left corner. Assisted by Kyel Reid following a set piece situation. Foul by Amine Linganzi (Swindon Town). Kyel Reid (Colchester United) wins a free kick on the left wing. Oliver Lancashire (Swindon Town) wins a free kick in the attacking half.